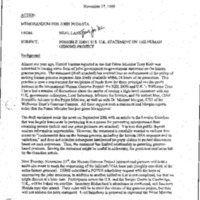 This series of General Files contains miscellaneous records relating to Chris Jennings’ meetings and various health care topics. The records include correspondence, faxes, emails, handwritten notes, meeting contact lists and forms, fact sheets, and memoranda. 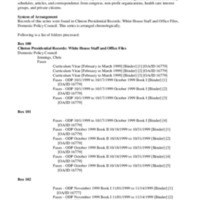 This series of Subject Files highlights health care topics relating to budget, tobacco, Medicare, Health Security Act milestones (Tollgate), Medicaid, CHIP (Children’s Health Insurance Program), legislation (including the Kennedy-Kassebaum Bill, the Balanced Budget Bill, the Breaux-Thomas reform plan, the Mental Health Parity Act of 1996, the Patient’s Bill of Rights, and the Health Security Act) prescription drugs and labeling, privacy, the Medicare Commission, and the President’s Advisory Commission on Consumer Protection and Quality in the Health Care Industry. 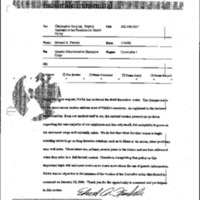 The records include reports, handwritten notes, memoranda, draft legislation, articles, emails, faxes, publications, and correspondence from congress, non-profit organizations, health care interest groups, private citizens, and federal agencies—specifically the Health Care Financing Administration and the Department of Health and Human Services. 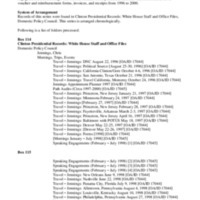 This collection consists of records related to health care appropriations and legislation from October 1999 to December 2000. 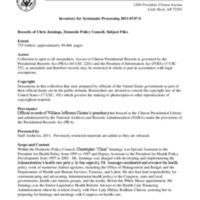 This collection consists of reports, memoranda, draft legislation, resumes, the First Lady’s schedules, articles, and correspondence from congress, non-profit organizations, health care interest groups, and private citizens. This collection consists of records related to Chris Jennings’ travel, speaking engagements, and meetings. This collection contains correspondence, faxes, invitations, email, travel voucher and reimbursement forms, invoices, and receipts from 1996-2000.